A slip or fall can quickly change your life, setting you back for months as you recover from your injuries. More serious accidents can even result in permanent disability, which can be accompanied by physical and emotional anguish as the victim struggles to cope with the reality of a diminished quality of living. The Peoria slip and fall accident attorneys of Rosenfeld Injury Lawyers LLC are committed to leaving no stone unturned when utilizing the many avenues available to recover fair compensation for your injuries and will make sure that you receive no less than what the law allows. While slip and fall accidents are more likely on the job, they can also occur when property managers do not take the needed steps to protect their guests from common hazards. Poor building maintenance, defective equipment and property that is not built to code are all contributors to these types of accidents and negligent building management needs to be held accountable whenever someone is harmed. Here are the most common causes for slips and falls we've seen. Defective pavement and sidewalks— uneven pavement and sidewalks can present a tripping hazard for people coming and going while potholes and other defects in the pavement can pose similar hazards. Ice, rain and snow— it should go without saying that property managers need to be prepared for inclement weather in our climate. Ice and snow are not just exterior hazards, but can become interior hazards when they are tracked indoors by guests. It is the duty of management to make sure that steps are taken to clear parking lots and sidewalks while laying down materials inside that will provide traction when the floors become wet. Lack of lighting— dimly lit staircases, poorly lit hallways and lack of lighting in areas that guests use to enter and leave the building can contribute to accidents by making it more difficult to see objects that pose a tripping hazard. 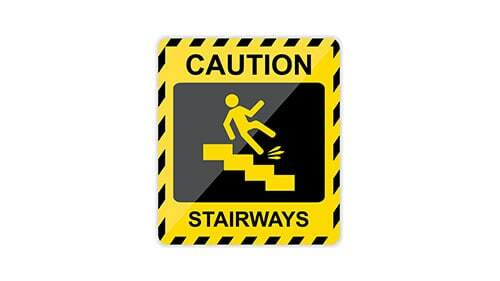 Defective staircases— it is important that building owners are aware of any problems with staircases and act on them quickly to ensure that guests do not hurt themselves on broken steps or because of excessive clutter or poor lighting. Poorly built balconies— a balcony collapse can be devastating and these incidents occur because of poor construction and maintenance practices. Balconies also need adequate guardrails that can bear the weight of the people leaning against them. Workplace hazards— employers are also required to make sure that their workers and guests have access to a safe environment. This means placing warnings to alert workers to wet floors and other potential hazards and keeping common areas free of clutter and debris which may pose a trip or slip hazard. Proper guardrails and safety equipment must also be used to minimize the risk of fall accidents. Depending on location, surface, height of a fall and other factors, a slip or fall accident can cause injuries of varying degrees of severity. Some of the most common injuries that we see include the following. Traumatic brain injuries— the problem with traumatic brain injuries is that they can escape the notice of medical professionals until it is too late. After sustaining trauma to the head, the victim's brain may have microtears that fill with blood and fluids. Over time, this can cause severe brain damage, impacting cognitive function, concentration, memory and motor function. Neural retinopathy— this condition occurs when nerves are damaged in an accident and can cause loss of feeling in the affected limb, diminished motor function, a tingling or stinging sensation or severe pain as the damaged nerve sends the wrong signals back to the brain. Spinal and back injuries— falls from significant heights can result in back and spine injuries, but a trip or slip can also cause damage to the back or spine in the form of ruptured discs, broken vertebrae and damage to the spinal cord itself. Broken bones— it should come as no surprise that fractures are extremely common injuries resulting from slips and falls as it is a natural reflex to tense while bracing for an impact and this places extra pressure on the bones and makes the body more rigid. If you have been injured in an accident that you feel is the fault of your employer or a negligent property owner, Rosenfeld Injury Lawyers LLC can help you recover fair compensation for your injuries. This can be used to cover the cost of your medical expenses, lost wages, pain and suffering and out of pocket expenses. Our legal team excels at finding the proper value for your claim and making sure that you can recover the maximum allowable amount of damages. Contact us today to arrange a free consultation with one of our award winning Peoria slip and fall accident attorneys so that we can review your claim together and let you know more about your legal options. If we are unable to secure damages on your behalf, you are assured our services will be free of charge.